After months of uncertainty, a rejected crowdfunding bid and the withdrawal of the biggest company in the running, the conseil municipal (town council) of La Grave has awarded the concession to run the ski lifts to SATA – the Alpe D’Huez lift company. The decision was made following a unanimous vote at a public meeting held on Friday evening. Like the previous lease, awarded in July 1987 for a symbolic French Franc, the new concession will run for thirty years. The agreement should assure the future of the lift system until 2047, allowing businesses in the town to breathe a sigh of relief. The Société d’aménagement touristique de l’Alpe d’Huez (SATA) will take over the transport of mountaineers, skiers and tourists on the mountain from 15th June this year. Unlike the Compagnie des Alpes – the other major company with an interest in the area, SATA is majority owned by the commune of Alpe D’Huez. This makes it a more popular option for many locals, although others would have preferred the crowd funded approach of the Signal de la Grave project. 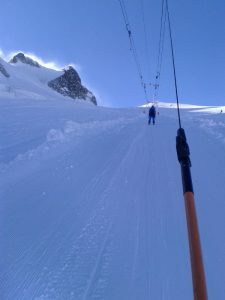 The Compagnie des Alpes runs lift systems in many French resorts, including Les Deux Alpes, and was widely seen as being likely to take on La Grave. However they withdrew their bid earlier this year citing a lack of access to information and infrastructure during the bidding process. The town have imposed a number of obligations on the new operator of the lift. They will be expected to re-employ the existing staff, renovate or modernise the lift system, renovate or rebuild the two mountain restaurants and remove obsolete lift installations. Most significantly, they are to build a gondola or cable car to the Dome de la Lauze by 2021. 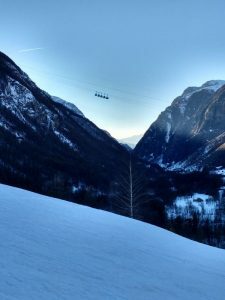 This third stage of the lift system, ascending to almost 3600 metres, will improve the link to Les Deux Alpes and allow access to non-skiers at a projected cost of 10 million Euros. After some difficult years with below average snow conditions and road closures limiting access, there are high hopes that the new ownership will mark the start of a new chapter for town and its ski lifts. 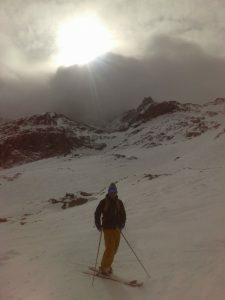 At the same time, many locals and La Grave aficionados will be watching anxiously to see if the area’s unique character can survive the changes.